Book review #1 of 2013! 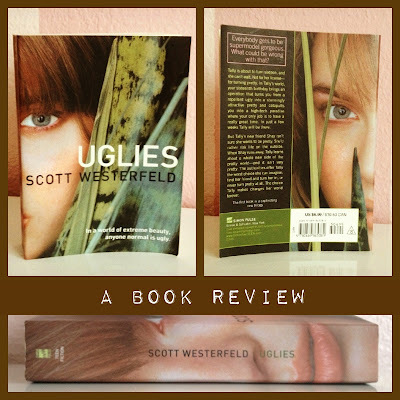 Scott Westerfeld's Uglies is a book I have seen for a long time. My sister must have read it 6+ years ago and I have seen it on her shelf often. I read the back cover when I first saw it and immediately thought it sounded super cheesy. My sister made a discouraging face and told me it wasn't that good so I put it down without a second thought. Fast forward 6 years and I became curious again. This time, I had friends who once again discouraged me from reading it hinting of its shallowness and similarities to America's Next Top Model. That was enough to sizzle out the desire for a bit longer. When the curiosity came back, I decided just to forgo all the negative feedback and just read it to end the curiosity once and for all. And let me tell you, I am very happy I did. "Tally is about to turn sixteen and she can't wait. Not for her license- for turning pretty. In Tally's world, your sixteenth birthday brings an operation that turns you from a repellant ugly to a stunningly attractive and pretty and catapults you into a high-tech paradise where your only job is to have a really good time. In just a few weeks, Tally will be there. But Tally's new friend Shay isn't sure she wants to be pretty. She'd rather risk life on the outside. When Shay runs away, Tally learns about a whole new side of the pretty world- and it is very pretty. The authorities offer Tally the worse offer she can imagine, find her friend and turn her in, or never turn pretty at all. The choice Tally makes changes her world forever." A little cheesy right? That description really does make the novel come off as a shallow piece of literature targeted towards teenage girls with the moral that you shouldn't judge a book by its cover. That is essentially what everyone who talked to me about this book made it out to be. There are many ways to read one novel, and if you're in high school and are obsessed with the feeling that you don't fit the banal qualities that highschoolers seem to deem as desirable, then it's very likely that that is how you will read this book. I am, however, several years out of high school and read this book differently. I found this book to be rather eye-opening. I'm sure those existing in a free form society like to believe that they are free, independent thinkers that are aware enough to judge others for more than outward appearances, but this is not always the case. I had a friend, who I will call Maggie, who has on numerous occasions has told me she wanted to befriend someone either because of a.) their high attractiveness level, or b.) their resemblance to a celebrity who also has a high attractiveness level. And mind you, this was said in all seriousness. Maggie proceeded to pursue that friendship to some success I might add. And then there's another friend, who I will refer to as Jillian. Jillian liked to play a game where she rated the attractiveness level of strangers. She once had to make the claim to me that she really would date someone for their personality even if they were unattractive then went on to complain to me endlessly when this guy she really liked and was currently dating had a tiny mole on his nose (which I saw for myself and was nothing like the state of Alaska she made it out to be). My point with Maggie and Jillian is that humans are not as sophisticated and free of the inherent Darwinian claims that this novel makes. So, if you renounce this book solely on the premise that it's foundation is outdated, think about how you have last interacted with someone who you found incredibly attractive and someone who you found completely physically repulsive. Now, more about Uglies itself. I personally found the cast of characters rather likable. The third-person limited omniscient narrator gave me enough insight into Tally's mind that I felt I could relate to her. If I were her, I probably would have been ecstatic to get a surgical makeover. She has a decent balance of superficiality and human fault that I don't find her too unbearable. As for Shay, I felt for her how I felt for Moira (The Handmaid's Tale), a lot of promise and hope. Overall, I think the novel has a good cast of characters with definable personalities. The world in New Pretty Town (the town of the young pretties) and Uglyville (the town of awkward, non-surgically touched teenagers) is an interesting one. Maybe I missed something, but I wasn't quite sure how school or family life worked. It seemed to me that you start out as a kid (their term, Littlie), and once you turn 13(?) you become an official Ugly, waiting to turn 16 so you can become a Pretty. Somewhere between becoming a Pretty and dying you become a part of the working field within the city somehow. The city has different areas such as New Pretty Town and Uglyville where those appropriate are meant to stay, but I was slightly confused about how school worked. Did they share the same school campus? Library? Grocery store? Movie theatre? Possibly details I looked over/forgot but either way, I don't remember them being entirely clear. That, however, only took up a slight portion of the book so it was easy to over-look. What I enjoyed most about the book was probably the cast of characters and all the detail of everyone's physical description. This is a book that really depends on the difference between being "ugly" and "pretty" and I think the descriptions did it well. Tally has internal struggle that makes her very easy to relate to and I enjoyed her very much. I also think that the twists/discoveries in this novel make for a very interesting society, and if there's one reason why I love dystopian novels so much, it is definitely for the strange and unique societies! I love learning about these dystopian societies and how they mirror or oppose our current society. I love placing myself in that environment and mulling over how I think it would work or not work. I would say that the last 25% of the book was the slowest, but overall the book was very well done. I have already completed all four installments of this series and Uglies is probably my favorite one, closely followed by Specials (the third one). I am happy I picked up this book despite the feedback from those around me. Very fun, thought provoking (if you allow it to be), and quick read. I definitely recommend this to those who enjoy teen dystopian novels such as Divergent or The Hunger Games.